China’s nine-dash line will have its day in international court. 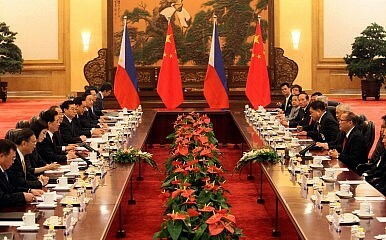 In a press release, the Court noted that the decision was “unanimous” and “concerns only whether the Tribunal has jurisdiction to consider the Philippines’ claims and whether such claims are admissible.” Notably, the Court has rejected an argument in China’s position paper that the “2002 China–ASEAN Declaration on the Conduct of Parties in the South China Sea constitutes an agreement to resolve disputes relating to the South China Sea exclusively through negotiation.” The Court has decided that the Declaration on Conduct was a “political agreement that was not intended to be legally binding.” This may influence the already lethargic process between China and ASEAN toward a binding Code of Conduct for the South China Sea. As the Court prepares to consider the merits of the Philippines’ claims, it’s worth revisiting what exactly Manila is seeking a decision on. As Jay Batongbacal succinctly outlined over at the Center for Strategic and International Studies’ Asia Maritime Transparency Initiative earlier this year, Manila is looking for the Court to decide on four primary questions. First, and most vexing for China, is the status of Beijing’s nine-dash line claim in the South China Sea. Manila argues that the nine-dash line is an excessive maritime claim and not in line with the entitlements for coastal states under UNCLOS. With jurisdiction question resolved, we can look forward to China’s nine-dash line getting its day in international court (although, notably, without China taking part to defend it). China has kept the scope of its nine-dash line ambiguous under formal and customary international law, but once the Court decides on the matter, its ability to maintain ambiguity will be limited. Third, the Court will evaluate the Philippines’ argument that China is illegally exploiting natural resources within areas that would fall under the Philippines’ exclusive economic zone (EEZ) under UNCLOS. Fourth, Manila claims that China has interfered with its ability to freely navigate its own EEZ. Though China has refused to formally participate in the proceedings of the Court, it issued a position paper on the issue of the Court’s jurisdiction in December 2014. The Court has since accepted this position paper as a formal submission by China and took it into consideration in Thursday’s decision. With the jurisdictional issue resolved, the Court will move forward now to assess the merits of the arguments being made by the Philippines and China. International law may come to play a major role in determining where tensions in the South China Sea end up. The Court expects to issue a decision on the merits of this case in 2016. The highly anticipated verdict will offer clarity on maritime entitlements in the Spratly Islands.